TCI® offers the perfect solution for street cruisers who want excellent street performance and long lasting durability. 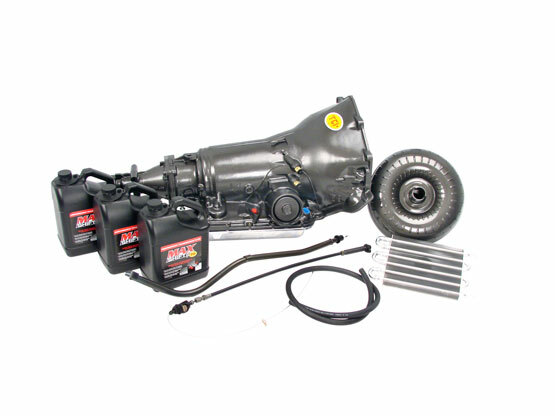 Using the highest quality TCI® manufactured components, each Street Rodder™ package is equipped with an automatic valve body and Valve Body Performance Improvement Kit that allow you to achieve firmer, yet not too harsh shifts in the vehicle while remaining fully automatic and retaining the stock shift pattern. Horsepower figures range from 350-525 HP, dependant on the application. Transmissions and their internal components are inspected and stock parts are replaced with high performance TCI®-manufactured parts where applicable. Valve bodies are remanufactured and 100% tested prior to installation. Last, each transmission is subjected to both a static hydraulic pressure test during assembly and a final dyno test prior to shipping. That's Triple Tested for your specific application. TCI® StreetFighter® Transmissions are designed to withstand the rigors of street machines ranging anywhere from 400 to 775 horsepower with a non-supercharged system using pump gasoline, depending on application. Equipped with a TCI® manual/automatic valve body, most units allow you to manually shift the vehicle into each gear change or, by placing it in the drive position, remain fully automatic. This gives you racetrack shifts and shaves time off your e.t.’s. TCI® 700R4, 2004R and AOD StreetFighter® Transmissions also feature a TCI® Constant Pressure Valve Body™ to ensure that clutches and bands are applied firmly to eliminate slippage. The TCI® Super StreetFighter™ Transmission Packages fill the gap between the StreetFighter® series and the full competition transmission packages. 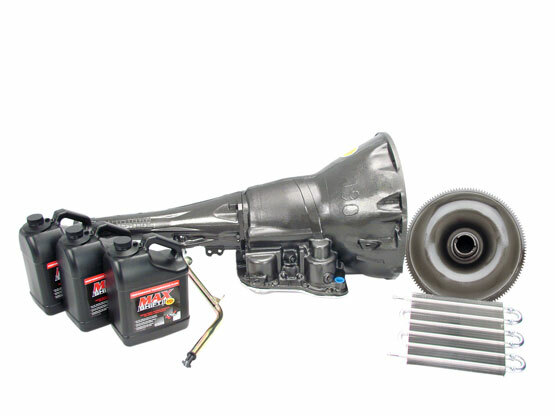 Intended for normally aspirated vehicles powered by engines producing between 725 and 1025+ HP, depending on the application, TCI® Super StreetFighter™ Packages feature the many of the same benefits as StreetFighter® Transmission Packages with certain internal upgrades, including higher performance friction clutches and bands, as well as heavy-duty hard parts. The Super StreetFighter™ Transmission offers both manual and automatic shift options to give you the power and shifts you want for the strip or easy driving for the street. 700R4, 2004R and AOD Super StreetFighter™ Transmissions feature a TCI® Constant Pressure Valve Body™ to ensure that clutches and bands are applied firmly to eliminate slippage. Super StreetFighter™ Torque Converters feature furnace brazed fins, needle bearings, hardened pre-ground pump hubs and like all TCI® converters, undergo the renowned Triple Testing procedures. Using the latest developments in drivetrain technology, TCI® has developed an innovative automatic transmission for Pro Touring, street and all-out race vehicles. Designed for GM SBC, BBC, LS and BOP applications, as well as Fords and Chryslers, the 4L80E-based TCI® 6x Six-Speed Automatic Transmission is a fully programmable transmission that gives you six forward gears (2.97, 2.23, 1.57, 1.18, 1.00, 0.75) for quicker acceleration and increased fuel economy at cruising speeds and is capable of handling up to 850 horsepower. When used with the required TCI® EZ-TCU™ Transmission Controller and harness for shift point programming and the optional TCI® Paddle Shifter or Outlaw™ 2-Button Shifter set-up for manual mode gear selection, this automatic transmission gives vehicles the most functional and modern drivetrain combination on the market. To ensure durability, TCI® engineers run each transmission across a hydraulic tester valve body dyno and computer-controlled transmission dyno to ensure proper line pressures and top notch transmission performance. Proof of this Triple Testing process is included with each transmission, shipped in the form of individual serialized spec sheets containing test scores. In addition, each TCI® transmission utilizes the patented HDT Coating™ for cooler operating temperatures and improved drivetrain efficiency. 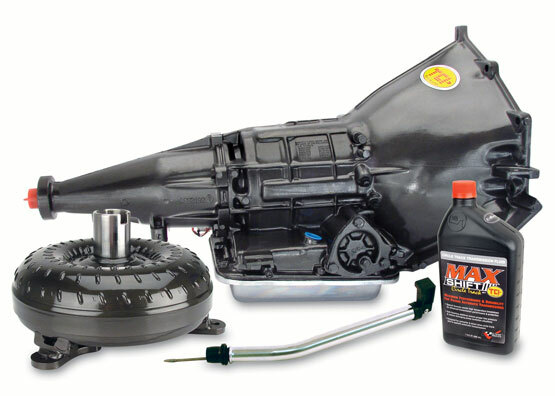 Heavy-duty Maximizer™ Transmission Packages combine specifically matched components to produce a firm, steady shift that is perfect for trucks, RVs, 4x4s and towing applications. 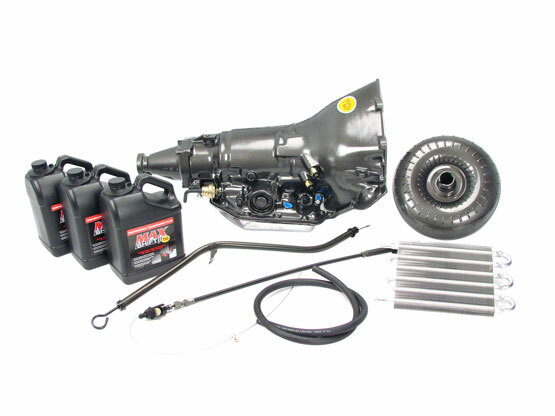 Each component-matched TCI® Maximizer™ Transmission Package contains a TCI® transmission and torque converter, universal transmission cooler and three gallons of premium TCI® Max Shift™ Performance Transmission Fluid. Each transmission and torque converter were individually Triple Tested and certified to ensure that you receive the best possible package for your application. 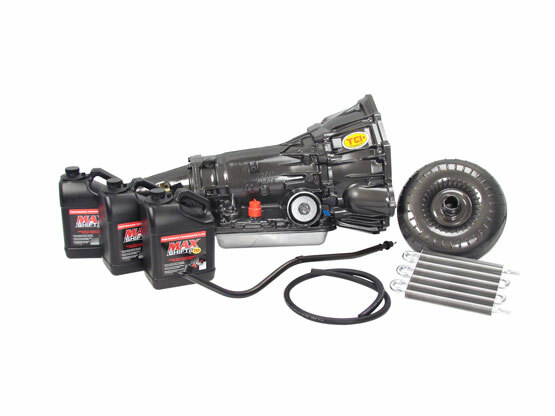 Maximizer™ Towing Packages were designed to be used in applications ranging from 450 to 550 HP. Transmission include a valve body that has been individually tested to ensure proper shifting and correct alignment while the transmission itself was hydraulic and dyno tested. The torque converter has also been tested and includes upgraded parts, including furnace-brazed fins for increased durability and heavy-duty caged bearings that are much stronger than individual style bearings. Another important feature of the torque converter is improved cooler flow for improved cooling and planetary lubrication. Also included is the popular Max Shift™ Transmission Fluid that reduces internal friction and heat build-up (while promoting clutch lock-up) for increased shift quality and life. The premium fluid was developed with ultra-pure base oils that resist viscosity breakdown and extend fluid change intervals and exceeds Mercon® and Dexron® performance specifications. Most important, Max Shift™ contains exclusive friction eliminating, anti-foaming, and extreme heat additives and no other additives or treatments are needed. Simply pour in Max Shift™ for an instant upgrade for your new Maximizer™ RV & Towing Package. Electronic 4L80E-based can be used with original GM controller or TCI® EZ-TCU™. TCI® Circlematic™ Transmission Packages use the latest developments in drivetrain technology to deliver superior performance in one convenient package. All Circlematic™ Transmission Packages come with everything you need to enhance drivetrain performance and durability, including a triple-tested TCI® Circlematic™ Transmission; a matching, precision-tuned and performance-matched TCI® Circle Track Torque Converter where applicable (some packages contain pump drives or stock appearing, non-functional converters); dipstick and premium, high-viscosity TCI® Max Shift™ Circle Track Transmission Fluid. As with every TCI® Circle Track Transmission, those used in circle track packages include several advantages over the commonly used manual transmissions, including lighter weight (50-60 lbs. over standard), more economical pricing and performance improvements. Some of these performance improvements include instant throttle response, superior engine braking capabilities and quicker lap times. The converters used in these packages are specially designed with a lower “positive lock-up” stall speed which can eliminate up to 10% of power robbing slippage found in OEM and lesser quality converters. This can ultimately result in reducing lap times by as much as one to two-tenths of a second. Circle track racers looking for the ultimate transmission/torque converter setup will find the TCI® Circle Track Transmission Packages to be the perfect solution.